Glass bottles in innovative designs are key to creating successful brands, attracting consumers’ attention and setting new trends. This has been demonstrated recently by a number of award-winning glass bottles produced by O-I, the world’s largest glass packaging manufacturer. The awards have been won across many different segments – NAB, beer and wine – around the world, showing the flexibility of glass as a packaging material. With the continuing trend towards premiumization and individualization, new design features – such as O-I’s innovative internal embossing technique – are gaining in importance. 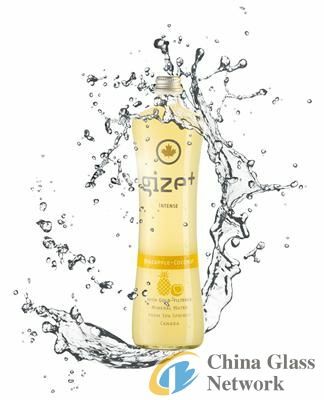 Among the glass bottles to be recognized for their innovation and creativity is the Gize-bottle, which is produced by O-I for the Gize mineral water from Canadian Mineral Water S.A. (CMW). It has this year received a total of ten national and international awards, including the Gold Pentaward 2011. The Gize glass bottle triumphed in the “beverages” category, beating almost 1,000 competitors from five continents. It will be displayed in the exclusive Paris DesignPack Gallery and published in “The Package Design Book”, available worldwide. The Gize bottle design was the brainchild of advertising agency “Zweipunktnull”, working in close collaboration with O-I. The product is presented in a bottle with an elegant shape, featuring clear lines, a slim, tapered waist and a shoulder and base of the same diameter. O-I has also won a number of recent awards for its own innovations, developed proactively to differentiate its customers’ brands in the marketplace. A Gold Pentaward 2011 went to the Vortex® bottle - one of the first examples of O-I’s new proprietary internal embossing technology, which enables specially designed grooves to be applied to the inside of the bottle’s neck. Earlier this year, the Vortex® package also received an Industrial Design Excellence Award (IDEA) from the Industrial Designers Society of America. Amongst others, Vortex® is used by US brewery MillerCoors for its Miller Lite beer, Australia’s Gage Roads Brewing Co. for its Wahoo Premium Ale and New Zealand’s DB Breweries for its Tui Blond Lager. Other recent design innovations from O-I to receive high profile recognition are its patented Black Glass and its Lean+Green® lightweight range. Independent Distillers’ Three Kings range featuring O-I’s Black Glass recently won the Silver Award in the Beverage category at the 2011 Australian Packaging Design Awards, while O-I’s Lean+Green® wine bottle range was honoured in the Innovation and Supplier of the Year Awards by the Wine Industry Suppliers Australia (WISA). Earlier this year, O-I launched a global marketing campaign, called Glass is Life™ (http://GlassIsLife.com), showcasing the unique qualities of glass packaging, and its unmatched ability to build successful food and beverage brands. The campaign features individuals around the world – CEOs, brand managers, chefs, environmentalists, designers and other opinion leaders – explaining in their own words why glass packaging is so important to them.